Easy Dinner: Salisbury Burgers, Weekly Menu Plan. The vegetables are in the pasta sauce - easy dinner. Similar to the oft-dreaded 'Salisbury Steak', only much, much better. Finished with a red wine and mushroom sauce. Finely chop 2 tbs each of the onion and celery. Trim mushrooms and thickly slice. Finely chop enough of the sliced mushrooms to equal 4 tbs. Put the finely chopped 4 tbs mushrooms, 2 tbs onion, 2 tbs celery, bread crumbs, 1/2 tsp paprika, marjoram and beef in a large bowl and mix well. Add the burgers and sauté, 5 - 7 minutes per side, turning carefully. Remove, cover to keep warm. Add remaining mushrooms, onions, celery, paprika to skillet and sauté about 5 minutes or until tender. Add beef stock, red wine, tomato paste and stir well. 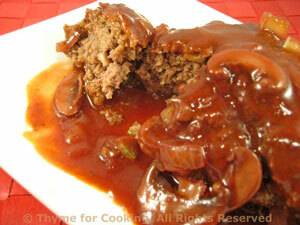 Return patties to pan, reduce heat and simmer 5 minutes to blend flavors and heat patties. White beans make a wonderful creamy sauce, without the cream and lots of cheese. I also use this with filled pasta (ravioli) in which case, I leave out the cheese in the sauce. Heat oil in a medium saucepan. Add shallot, garlic and sauté until tender. Add beans, wine and chicken stock. Bring to a boil and simmer 5 minutes. Remove and purée in blender or with immersion blender. Return to heat, stir in thyme and bring to a simmer. When pasta is ready put into bowl. Remove sauce from heat. Stir in half of the cheese and pour over pasta. 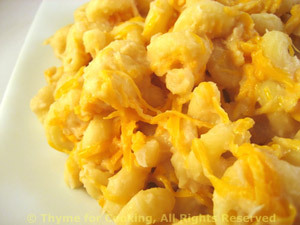 Sprinkle with remaining cheese and serve.